Monday marks the Chinese New Year with 2012 being the Year of the Dragon. According to the Chinese zodiac, dragons are passionate in all they do and often do things in grand fashion. 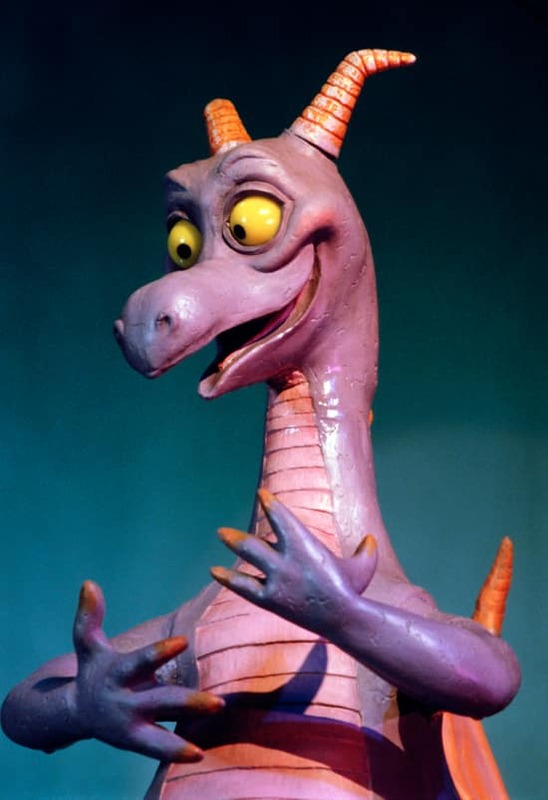 I know of a particular Disney dragon for which the same could be said – Figment, the dragon of curious mischief and childlike naivety, who has been the mascot of the Imagination! Pavilion at Epcot since 1982. 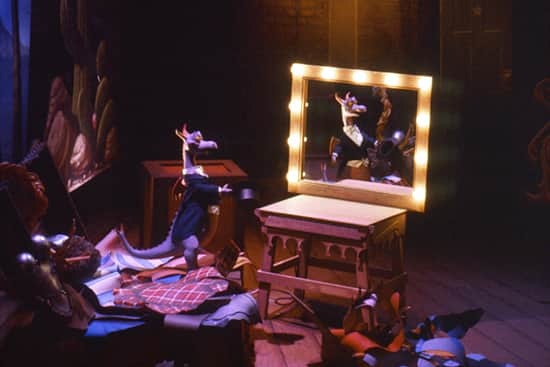 Dreamfinder combined the body of a lizard, the nose of a crocodile, big yellow eyes, the horns of steer, two tiny wings and a dash of childish delight to create the infamous figment of his imagination that materializes as a pint-sized dragon. 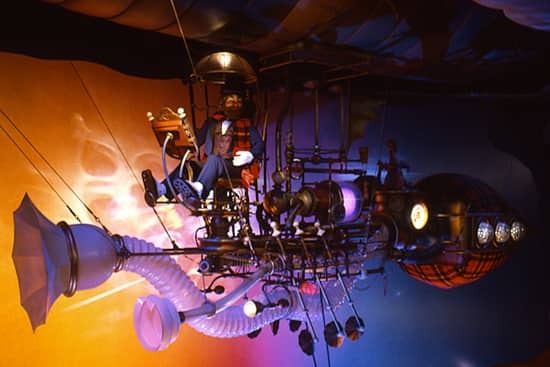 In Journey into Imagination, the original attraction (as seen above and below) at the Imagination! Pavilion, Dreamfinder and Figment took guests into the hidden worlds of Art, Literature, Theatre, Science and Technology. Over at the Imagination! Pavilion you don’t have to wait every 12 years for a Year of the Dragon. Figment ignites little sparks of imagination every day. I wish they would bring back the original ride. I, too, wish they would bring back the original ride. More Figment in the parks please. I agree with the previous posters that an attraction worthy of the original should be added to the Imagination pavilion. In the meantime, let’s see more great photos from the original! High quality photos of it are somewhat rare given the low light and lack of digital photography prior to 1998! The original Figment ride was and always will be my favorite of all the rides at Disney World. I enjoy the new one but it’s just not the same. I wish they would bring back the original version. We need more Figment in Epcot!! I wish we could bring back the old ride! Figment is the man!! I really miss the bank I got as a child at EPCOT in the early ’80’s. Fond memories of Figment to this day. You had a Figment bank? How cool! I loved Dreamfinder and the original ride! Remember when you could find them, live, outside the pavilion at times?! I loved Figment and the ride and activites. I so miss it now!!!! I took my daughter several years ago…expecting Figment and He wasn’t there….was disappointed…but we still had a great time. As a annual pass-holder, I can see how UN-popular the new ride is by the constantly short or non-existent wait times. The original attraction was one of the most popular in the park! Bring it back! I absolutely love the original ride. I can remember my first trip to Disney in 1987 with my family. Me and my sisters knew the Figment song by heart the first day we went to Epcot! The new ride isn’t as bad as the one they put up in between the two, which basically had no Figment at all. I wish they could bring back the original though, i’d love to take my daughter on it. I’ll just have to settle for showing her our home video of it one day. Please bring back the original figment and Dreamfinder! It was classic Disney at its best! Add me to the practically never-ending list of people who wish you’d bring back the original ride or at least something close to it – the Imagination Pavilion isn’t the same without Dreamfinder! Totally agree, I liked the original ride better. I don’t have a problem with the new one just a preference. It was my favorite when I visited for the first time in the 80’s! I also agree that the original ride was best. I don’t like the new “look” that Figment has taken on as well. The interactive post-ride imagination institution is great, but the ride doesn’t have the same feel to it. I would love to see more Figment merchandise all over the park!! I love Figment in any form or fashion, but I do miss the original. Hey, how about the new Figment falling asleep in the Sleep Lab and dreaming about his past????? Maybe have the ride split, one goes to the old and one to the new and tou never know which you will get? This is certainly making me miss the old one! I LOVE Figment! I have loved him since the first time I ever went to Disney World as a child. My first Figment merchandise was a hat that was lavender of course which was made to look like his head….sort of. Haha! At almost 37 I have a little stuffed magnet Figment that I have kept in my car for I guess about 5 years now? Last year, I almost bought a tshirt with him on it, but didn’t….I wish I had now! I will be going back in February….and I already told my husband….if we do nothing else at Epcot….I HAVE to stop by and see Figment! I had my pic taken with Figment and the Dreamfinder in the 80’s when I was a kid. I wish they would bring him back to meet fans. Love Figgy!! I’d love to see the original ride return. I miss its magic, given all that the ride did for my family so long ago. Put them all together, you’ve got a Figment! …not quite…I’ll add touch of childish delight! I love figment, it was a must ride when we used to visit , i didn’t revisit recently, but hoping very soon inshallah. I want to like the new version but it is a shallow version of what this ride once used to be. Little “imagination” is left in this ride. Bring back the classic. I guarantee it would revive EPCOT! I loved the original ride! I can remember going on it as a child and getting completely lost into this world and leaving with a great sense of inspiration and creativity! The new ride is… well…. I think its an interesting take but I don’t think that the use of the five senses (really only three on the ride) brings about inspiration to the imagination like it used to. As a pass holder who frequents the parks now, i have never had to wait in any kind of line for the new one… even at peek season. The original Journey into Imagination is still to this day my favourite attraction in any theme park throughout the World, the creativity, cutting edge technology, lovable characters and catchy music added up to an experience like none other. Meeting Figment out by the fountains along with Dreamfinder is one of my earlier memories of childhood; the interactivity with these characters was what pure Disney magic. The second incarnation that come along killed both Figment and Dreamfinder except for a little tribute made of lights and a small piece of re-used audio at the very end from Figment. Gone with the charm, music, lovable characters and amazing sets and in with boring and somewhat insulting tour through labs. So unpopular it didn’t last. Now the current version, although much better than the middle version, still not a spark on the original. A re-written version of the beautiful song along with Figment being brought back but still with quite lame boring sets and the requirement to point us where we have to look due to lack of sets surrounding the vehicles. It saddens me that there are whole new generations that label Figment lame because of this current ride, he deserves much more and I hope to one day see what WDI can do. I <3 FIGMENT!!! He is my favorite Disney character. I do miss the original ride, but I still enjoy the current one. I think what I miss the most is the interaction between Figment and Dreamfinder. 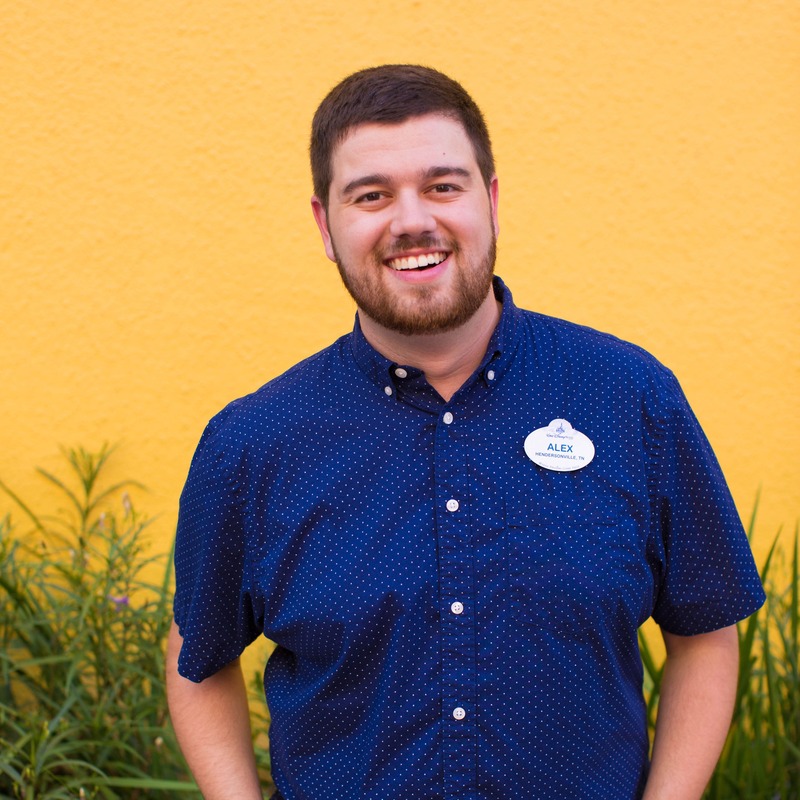 My recent trip to WDW (12/2011) I inquired about a character meet and greet. This has been offered from time to time in the past and according to the Cast Members they said if we want it back to bring it up with Guest Relations. Essentially I think we all just want and need more FIGMENT! "Imagination, Imagination. A dream can be a dream come true. With just that spark, in me and you. One little spark of inspiration, is at the heart of all creation. Right at the start, of everything that's new, one little spark, lights up for you. Two tiny wings, eyes big and yellow, horns of a steer, but a lovable fellow. From head to tail, he's royal purple pigment, and there, viola! You've got a figment!" this is why not every attraction needs to have a Disney movie icon in it. 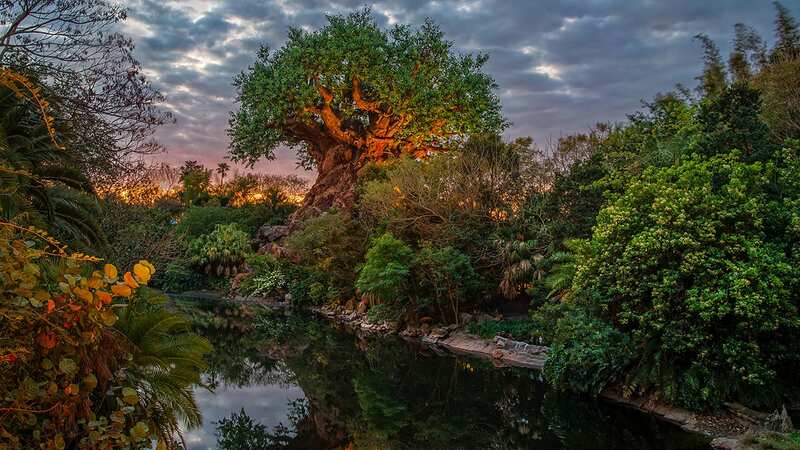 The imagineers are so skillfull that they are able to create loveble new caracters that can carry an attraction by themselves and are loveble and fun and entertaining and can do all that in just one ridetrough. On the current ride, yes the whole pavilion can´t stand in the shadow of the original one and needs to be un-re-done as quick as possible. I just returned to Disney for the first time in 20 years, I looked so forward to seeing Figment. I could not WAIT to get there to see Figment in and out of the Dream Finder’s Ride. After finishing the ride I was very disappointed it was not the same Figment I had been looking forward to seeing. The new one is very good. But I do prefer the original Figment. Hopefully the original ride and be brought back and either combine it with the new one or make it another ride on its own in the park. I would also like to see more Figment items for purchasing. Absolutely agree. The old ride was the best. When my kids were small they couldn’t wait to go see Figment. My youngest who is 30 still has his stuffed Figment. Figment and the original Imagination ride was wonderful! I was heartbroken when I brought my daughter there to experience the “magic” I had felt, at her age, only to find that it had been changed. Please bring it back!! Would a petition help to do this? I love Figment the dragon. But i really don’t like the current version of his ride. I liked the original ride better. Now when I go to Epcot I only visit the gift shop for my figment item. I LOVED the original Figment. When my husband and I took our sons for the first time to Disney I could not wait to introduce them to Figment, I was so disappointed that he wasn’t there. The new version is okay but it is not the original and I really miss all of the hands on activities they ahs at the end. I have a wonderful picture of my husband and I on our honeymoon with Figment and would have lived to have a family phot with him as well. I’ll just add my thoughts to the thread – re-work the ride back more in tune with the original. Figment is, and will always be, my favorite Disney character. (Sorry mickey, but that’s just the way it is.) I have bought just about anything Figment I could find at the parks whenever we go. I have the old Figment puppet from way back, several shirts, stuffed Figments, and on and on. I remember when Dreamfinder would be out in front with Figment on his arm. That was wonderful. Yes, bring it back. Bring it back. Imagine what we could be… if we could just imagine. My daughter loves Figment! She wore her Figment Ears almost our whole trip to WDW in 2008. Even now being 13, she still loves Figment, as do I! I even still have my Figment stuffed animal from 1987! I don’t remember too much of the old ride, but the new one is cute if not dumbed down a bit. What I wish Epcot would do is to bring back the Meet And Greet they had with him back in 2008! Our whole family enjoyed getting a picture with him and would be so fun to do again this June when we go back!! Please bring him back! I miss the old ride so much! It was one of my absolute favorites and one of the best things I remember from my visit there when I was five. I still have all the figurines from figment in the different scenes; the painter, the astronaut, one with a pot of gold. I still ride the new ride when I visit because I love figment but it always makes me a little sad and the strong skunk smell makes me queasy. Although I do like the shout out to the old ride on the TV in the upside-down room. The original Journey To Imagination was a classic. The attraction was full of imagination, and dreamfinder and Figment were the perfect hosts. The current version lacks the spark that the original had. I loved Figment as a child and my children LOVE Figment now. They ride it over and over again. They were sad when they got off the ride and there was not that much figment merchandise. As a child I seem to remember alot. Last christmas we went to my mother’s house who had all my old stuffed animals and my daughters were so happy to now be the new owners of a 3 ft figment. Wish there was more figment at EPCOT. P.S. They send about 20 figments to grandma’s email every year we go to EPCOT. The old ride was the best. I want them to bring back all the stuff after the ride too. The pin table! Color your Figment! My family named our family dog “Figment” since my dad wanted him to be a “figment” of his imagination. He was one of the best dogs we ever had and had one of the best names you could find! Thanks Disney!! Figment is by far my favorite Disney character, and sadly under appreciated. I do agree the original attraction was my favorite. I miss the Dreamfinder! I loved Figment when I first saw him in the 1980’s and I purchased the little collectible figures. As time went on the figures got tucked away in a draw. The cool thing is when I brought my 6 year old triplets to the Figment ride in 2006 and they fell in love with him too. They walked out singing and wondering what exactly he was. My son had to have a shirt which he wore to school over and over and those little figures now sit on a shelf in my daughter’s room. Wonderful memories! !